Home » BK Journal by Wakako » Our inventory room. Reinvented. January 3rd was a big milestone moment for our studio. We had the official furniture moving day for our inventory room! As we slowly have grown our collections we carry at Baum-kuchen, there was a strong need to stay functional, organized, and better oriented in the backroom. It was really a time. Imagine the entire inventory in the back room being brought out to the shop space so we could move these big shelves into a more strategic configuration... and then all the items to be brought back in. Yep. Our space looked insane for a day!! But we managed to get everything done with the team and were back in fulfillment on the next day. I love the new space. The items are better sorted and we can see all the shelving space so we are no longer looking for items behind other items on the deep shelves! And I have a small cozy nook for my workstation. Frido is also constantly updating our shop space. 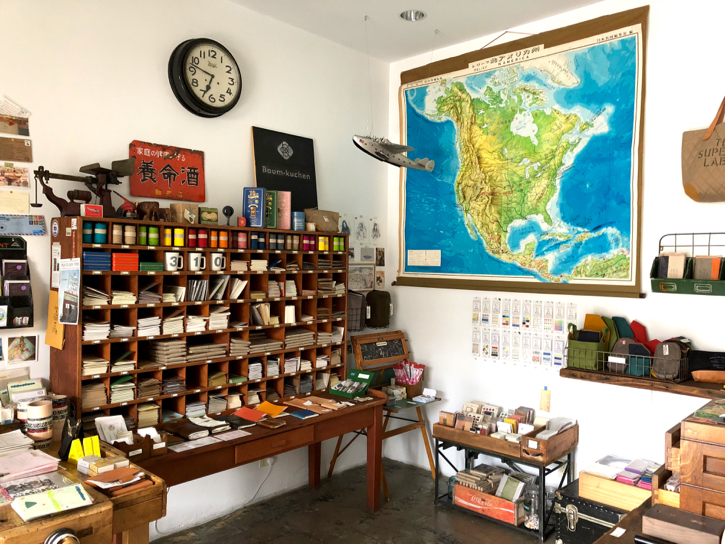 He added a Japanese vintage school map on the wall the other day and armed us with additional display space so we can showcase artifacts more thoughtfully. These are small steps and I know when I look back at these photographs, I will marvel at how much change we have gone through.